You have made your choice of stallion for your mare. You’ve paid all the vet bills associated with breeding your mare. Now, all you have to do wait for your new foal to arrive! 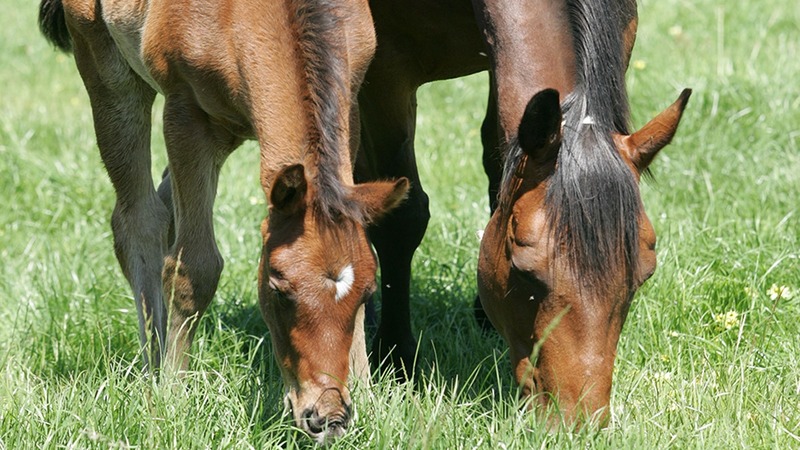 Nutrition plays an extremely important role in how your mare and foal develop and can weigh heavily towards ensuring that the foal develops to its full potential and your mare is equipped to continue producing foals long into the future. Preparing Nutritionally Preparing nutritionally, for your new born foal starts months before conception. Ensuring your mare is of an appropriate condition score (CS 3-4 out of 5) increases chances of conception. Ensuring your diets are balanced, for either a dry mare or a lactating mare whom will be returned to foal. The requirements for these two mares are drastically different as the lactating mare is caring for two as well as trying to return for another conception. For a mare that is in a fair condition score and pasture quality and quantity is sufficient a more concentrated diet such as Barastoc Legend would be a wise choice whereas for the lactating mare where additional calories and nutrients are required a full feed such as Barastoc Breed n Grow would be more suitable. In this brief article we will discuss nutritional requirements for both scenarios of feeding a dry mare through pregnancy and a lactating mare as it is often confused and lactating mares are fed on the same diet as a dry mare. Dry Mare For the dry mare the pregnancy can be broken into the 1st and 2nd Trimester, 3rd Trimester and Lactation. For the Wet mare we will discuss feeding during lactation, late lactation and weaning, 3rd trimester and returning back to lactation. When feeding the “Dry Mare” after conception we can treat them like another horse of equal weight at maintenance. We should be looking to maintain condition and match supplementary feeding to pasture and forages available. If pasture is abundant and of sufficient quality, a low feed rate supplement will address the vitamin and mineral requirements of the mare. If pasture is of poor quality a supplementary feed designed to be fed at a rate of 2-5kg per day such as Barastoc Breed N Grow may ensure the mare is receiving the correct nutrients as it will require additional energy and protein. Third Trimester Feeding The third trimester of pregnancy is where the foal will, double its weight, as a result the nutrient requirements of the mare increase substantially. This is a critical time for the mare and foal to develop and ensure no nutritional or developmental problems occur due to its nutritional intake. Over the last three months of pregnancy the mares’ energy requirement will increase by 10-20%. Protein requirements will increase by 20-30%. Calcium requirements increase between 70-80% and phosphorous requirements increase 80-90%. As you can see the ratios of nutrients vary as the mares pregnancy progresses compared to a maintenance ration. As a result by simply feeding more to your mare may meet her energy requirements however, it may not meet her increased protein, calcium, phosphorous and other essential nutrients requirements. If you do not meet your mares and foals increased requirement it can lead to reduced development of the foal and increase its risk of suffering from growth and nutritional disorders such as Developmental Orthopaedic Disorder (DOD). It can also lead to problems with lactation and the mare’s ability to conceive for the next pregnancy. Early Lactating Mare Once you finally have your new ‘super star’ hit the ground your mares’ requirement go into over drive. Your newborn foal will be growing at 1-2kg per day. The mare will be producing up to 20 litres per day of milk to ensure the foal is receiving nutrients. As a result your mares’ energy requirement will be nearly double (175%), protein will be (220%), Calcium and Phosphorous increase to (270-280%). It is nearly impossible for your mare to actually consume this much nutrients so she will have to draw on body reserves to ensure she maintains milk production from the foal. This is why it is important to make sure you keep your mare in a good to moderately fleshy (CS3.5-4) condition score during the last trimester of pregnancy. During this time you may wish to rejoin your mare. If she is in good condition and has a well-balanced diet the chances of a successful conception on first return will be greatly increased. Studies have shown incorporating certain nutrients such as selenium have improved conception rates in mares and fertility counts and sperm conformation in stallions. Late Lactating Mare For mares in late lactation which is generally termed from 3 months after foaling until weaning the mare will still have increased nutrient requirements compared with your ‘dry mares’. The mares’ energy requirements will be 150% of a dry mares requirements. Protein will be approximately 160% so as will Calcium and Phosphorous. As you can see the nutrient requirements for Lactating and Dry mares are quite different. As a management tool separating your wet and dry mares will enable you to ensure that each mare and foal are fed to their requirements and not an average of both.